Ah, Pinterest. We have a sticky love/self-loathe relationship (by self-loathe I mean that easy trap to fall into where you think you’re not succeeding as a parent / business person / partner / homeowner because of all these amazing things you see on Pinterest that you’re obviously not doing. By the way, it’s bologna. No one does everything well all the time. You can bet something is sacrificed.). DIY reupholstering. 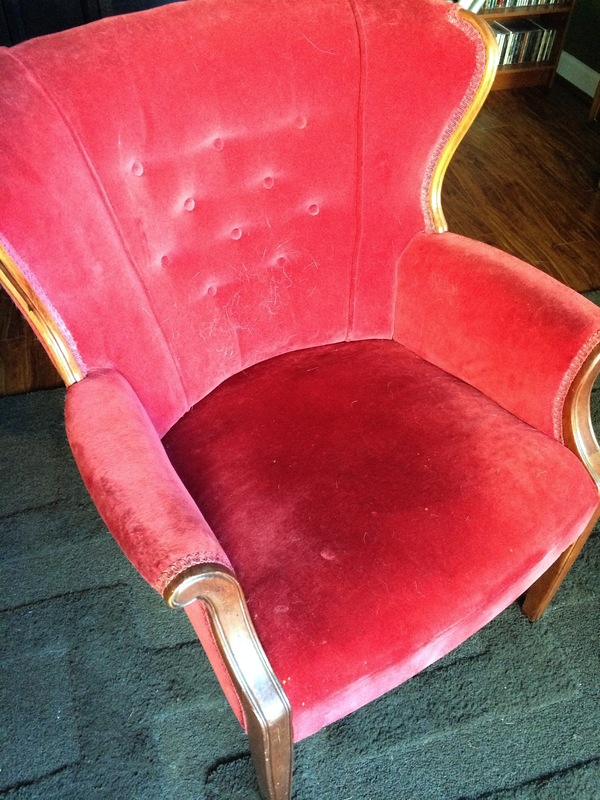 My grandmother, who was obsessed with French country decor, bequeathed this super sweet velvet tufted wing-back chair to me (is it really a wing-back?). See what my cat left behind? Even though I adore its original fabric, it’s worn bare in a few places and the pet hair really clings to it. It needs to be reupholstered. Maybe not tomorrow, but soon. So, I’m dying to try my hand at it. Now that I’ve had a go at tufting (I made a tufted headboard a couple years ago, which I’m sure I’ll post about at some point), I’m much more comfortable with the idea. 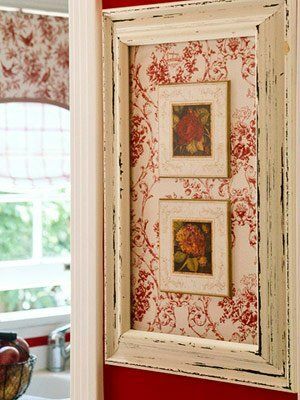 I’d also love to try my hand at painting an upholstered chair to give it a facelift. Yes, painting. Caulk my rugs to make them non-slip. Isn’t it genius? 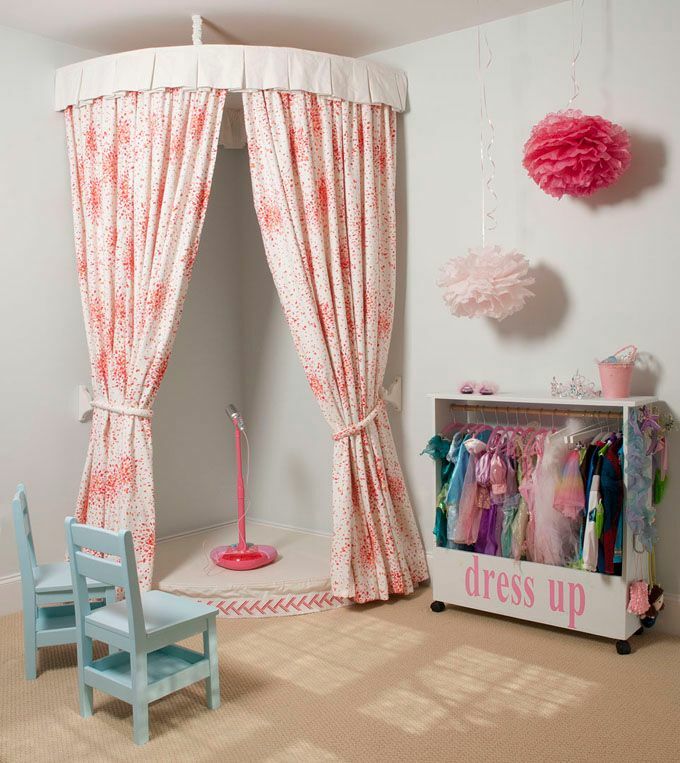 Make this tent in my toddler’s room. Ok, not actually this whole stage…just the curtain. I’ve made an embroidery hoop tent for her before, but it just was sturdy enough for my liking, and it also wouldn’t suit the corner of her room I’d like it to reside in. See, I’ve recently turned one half of her closet into a playnook, and I’d like the tent to cover the entrance so it’s more like a hideaway. Cord clean up. 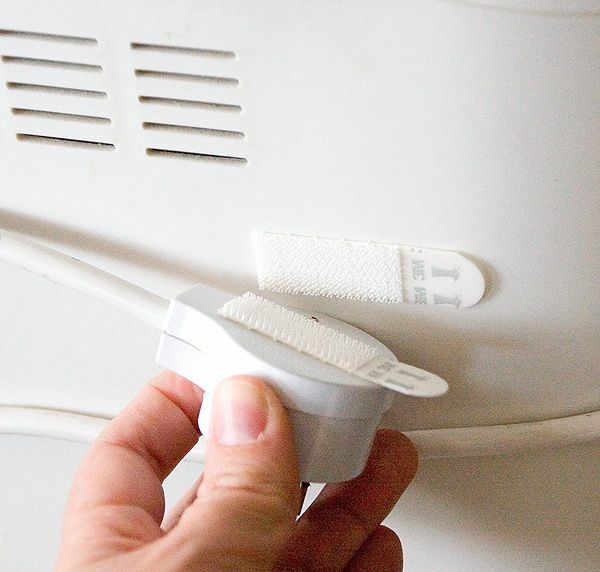 This pin combines two of my favorite things – tidy cords and command strips. What’s not to love? So, what are your favorite pins of the moment? Link in the comments. If you like what you see here, consider following A Happy Hue on Instagram @ahappyhue, Pinterest, Facebook (though you’ll see less from us on Facebook).